RANGOON — In a one-room hut in north Rangoon, a middle-aged woman has a trick for those evenings when the children complain of hunger and she has run out of money and rice. It is no surprise that Burma’s largest city is home to many residents who are barely making the most modest of livings. But the difficulties many working families face—not just daily but hour-by-hour—are a wake-up call for government and policy makers, according to a recent report. Life on very low incomes in Rangoon is about doing constant battle with cash crises, ill-health, and stress, the report’s findings show. 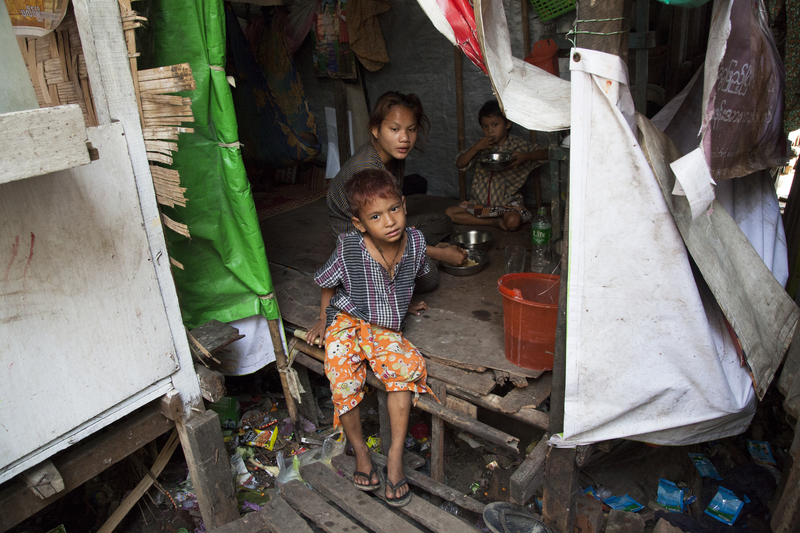 Researchers interviewed members of three hundred families in some of the least well-off sections of three Rangoon townships in late 2015 for Lives on Loan, Extreme Poverty in Yangon conducted by Save the Children together with the Yangon City Development Committee (YCDC). The vendors, food sellers, casual laborers, trishaw drivers, and factory workers interviewed just before Burma went to the polls for the first national election in 25 years were making prodigious efforts to pay their way in the commercial capital. Daw Tin Tin Lwin rose at 2 am most mornings to sell cooked rice at a market three bus rides away, for which she earned around 3,000 ($US2.2) kyats a day. Former Burmese orchestra musician Ko Min Zin had given up his profession in order to sell salads on the streets of Yankin Township for around 5,000 kyats a day, in the hope of providing a more steady income for his growing family and paying off debt. On the steps of a tiny hut in North Okkalapa Township, an ailing grandmother helped wash and stack thousands of broken beer cans every week for the small recycling business run by her family of four. But their efforts were not paying off, the report shows. 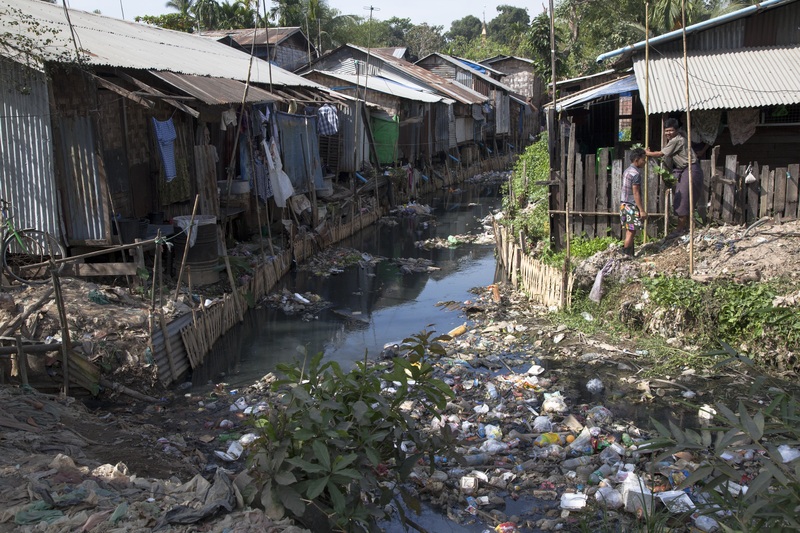 In huts cobbled together from wood, tin, bamboo, and plastic, many families were striving to live on less than 1,000 kyats (US$0.74) per person per day—well below the World Bank’s global benchmark of $1.90 a day for extreme poverty. Almost 90 percent of families were spending just 750 kyats per person on food each day, according to the findings from poor communities in North Okkalapa, Shwepyithar, and Seikgyikanaungto townships. A few households were relying on food from local monasteries to survive. Most other families were skimping on the amount and quality of food they shared. The impossibility of paying for food, rent, transport, and other expenses such as children’s schooling on tiny incomes meant that most families were juggling debts to a variety of moneylenders and pawn shops. Lenders typically charged around 20 percent interest on short term loans, which meant debts rose steeply and quickly to a point where they could become overwhelming. Deeply indebted single mother-of-three and daily casual worker Ma Aye Aye May described how she had spent an 8,000 kyats surprise windfall from a lottery ticket. 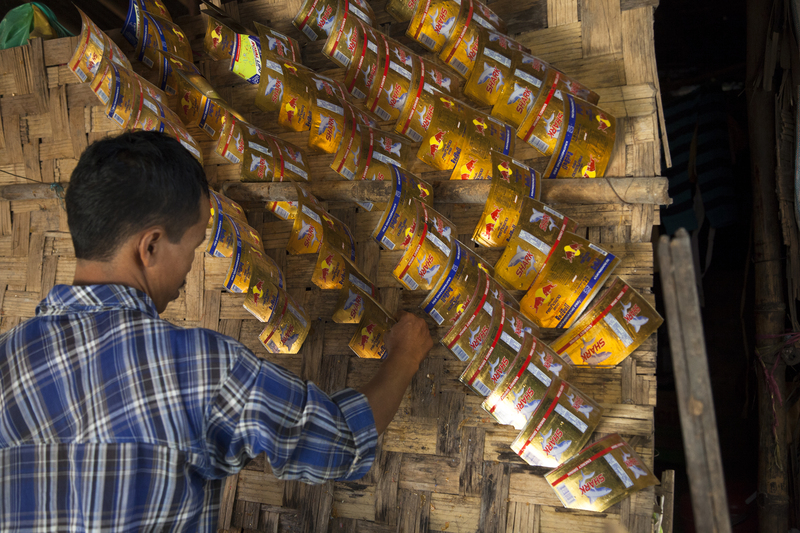 The first 3,000 kyats went against a loan at the local grocery shop. Another 2,000 kyat was given to a different moneylender. She gave 800 kyats each to two pawnshops to retrieve basic household items. A further 500 kyats was allocated to flowers for the family’s Buddha shrine and a soft drink, and the last 1,400 kyats paid for the family’s food for the day. “I was so shocked and happy,” Ma Aye Aye May told researchers of the rare day weeks before when she could placate many creditors in one go. “People are often frightened to think about how much they owe. They just wait in fear of the debt collector,” said urban poverty specialist Mike Slingsby who worked on the report. Money pressures meant that most families could not afford to keep their children in school for long. Children aged as young as eleven were staying at home to look after siblings or to earn small amounts of cash from casual jobs such as collecting water and firewood, the survey found. Others were supporting their families by working in small factories or as casual laborers. Stressful life conditions meant that the extremely poor were the most likely group to fall ill and the least able to afford treatment, the report points out. Heart disease, diabetes and tuberculosis were among the most common illnesses suffered disproportionately by people on low incomes. 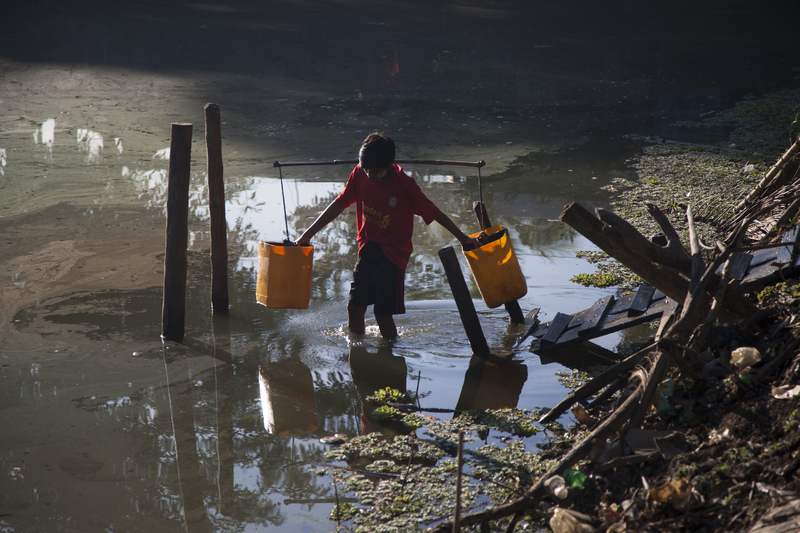 Overcrowding in squatter communities lacking basic water and sanitation facilities was contributing to a high incidence of respiratory and gastro-intestinal diseases and very low general health levels. Many patients’ health problems originate with malnutrition, Dr Yee Win Oo of a neighborhood clinic in the city’s north told researchers. As a growing Rangoon increasingly displays wealth in the form of private cars, new shopping malls, and luxury lifestyles, the city remains a magnet for migrants from impoverished rural areas, the report says. While national anti-poverty programs have focused on the rural poor, rising evidence showing shocking levels of urban deprivation suggests an adjustment may be overdue. In 2014 the World Bank said a fresh analysis of existing data had revealed poverty in Rangoon to be a “surprising” 34 percent – just a few points behind the national poverty rate of 37.5 percent. 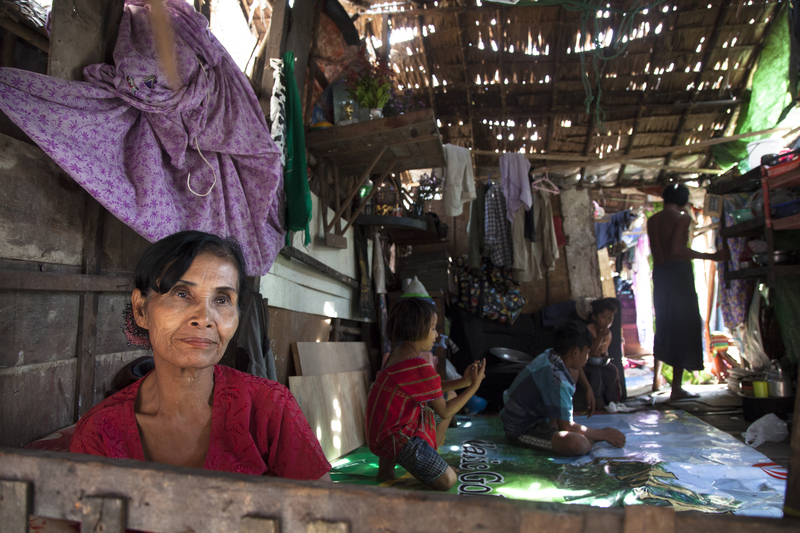 The findings in Lives on Loan provide additional evidence that the urban poor living in extremely difficult conditions deserve more attention from policy makers and a share in the massive aid budgets entering Burma. “Now that we know more about the scale of the problem, we must take action,” said Dr. Toe Aung of the YCDC. “We hope that this report can propel the government and civil society actors to work together to alleviate urban poverty,” he added. While the report was alarming it was also timely, said Katy Webley of Save the Children. Rangoon was at a “tipping point” in which there was still time to make investments in order to avoid the fate of other Asian cities such as Manila in the Philippines where millions of people live in grim slum conditions, she said. A healthy rural economy and a growing industrial base providing more and better-paid jobs in a context of political stability and peace may be the key long-term solutions to Burma’s huge poverty challenge. But there is a clear need for targeted interventions now on the most pressing issues in Rangoon, the report suggests. “The fundamental question is how to get more income, and stable income, coming into families–and how to address existing indebtedness,” said Slingsby. Services to match unskilled workers with jobs, informal apprenticeship programs for youth, group saving schemes and targeted small cash transfers that help families to keep their children in school, can help many poor families to avoid slipping into extreme poverty, he said. Nutritional support for infants and very young children has life-time positive impacts on the health and future prospects of children, Save the Children pointed out in the report which identifies a range of measures that could provide help to struggling communities. Meanwhile, waiting around for official assistance is not seen as an option for most of Rangoon’s poor who have long been used to relying on themselves. Trishaw driver Ko Aung Naing was not complaining about his circumstances when researchers found him cutting strips of bamboo to prop up his family’s shack that was sagging over swamp water in North Okkalapa. Life was good in the community where squatters lived across a lane from slightly better-off families in modest wooden homes, he said. “I’m in debt up to my neck,” he said with a large smile that was quickly returned by trishaw driver friends who had taken time off to help him shore up the teetering home. Disclosure: The writer worked with Save the Children on the text for Lives on Loan: Extreme Poverty in Yangon report. Names of interviewees have been changed in the text.